The arduous process of airplane boarding is experienced daily by millions of passengers across the globe. It is true that Airlines have experimented with a variety of boarding strategies aimed at reducing the gate turnaround time. Airline executives do everything possible to speed up boarding, if even by just a few minutes, to introduce additional flights into the day. This is a common scene witnessed by all when a planes departure is announced. Eager passengers line up outside the gate even before passengers on the incoming aircraft have even deplaned. The boarding cardholders rush down the jet way, with suitcases in tow. Ever since all domestic carriers instituted checked baggage fees, passengers are carrying more bags, scrambling to get space in the overhead bin. Passengers jostle their way in order to be the first one to board the plane. But with a little more planning by the airlines authority, one can secure a seat as well as bin space. 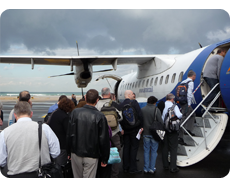 Another strategy adopted by most US Airways is to use the standard Rear-to-Front ;boarding. Boarding is done in the order - Elite passengers, followed by first and business class passengers. Seats in the rear part of the plane are boarded followed by the middle section and then finally the front area. It is widely agreed that one of the chief causes of time-delay for a commercial airline is passenger boarding time. Reducing boarding time, however, is proving difficult since it directly involves the passengers. By assigning passengers to groups or zones, the airline obtains some marginal control on the boarding process. In September 2003, America Airlines implemented a new aircraft boarding strategy that reduced the airline’s average passenger boarding time by a few minutes. The strategy, developed by a team of Arizona State University and America West Airline’s personnel, was a hybrid between traditional ;Rear-to-Front boarding and Outside-Inside boarding used by other airlines. They termed it as Reverse Pyramid boarding system. Zone 1 - seating the top frequent flyers, along with Star Alliance Gold elites from partner airlines. Zones 3-5 were designated for non-elites. After elites and passengers requiring extra assistance had boarded, US Air would board back windows first, then back middles and front windows, and so on. With the reverse pyramid, passengers simultaneously load an aircraft from back to front and outside in. Window and middle passengers near the back of the plane board first; those with aisle seats near the front enter the plane last. The reverse pyramid style was proving to be an efficient boarding system. But from May 2009, most US Airways have discontinued the reverse pyramid boarding style and resumed to use the standard Random seating order, giving preference to elite flyers and then to those who checked in online.